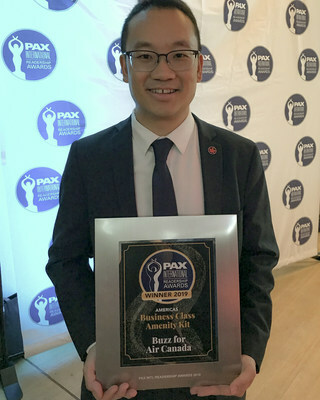 MONTREAL, April 4, 2019 /CNW Telbec/ - Air Canada's industry-leading position among North American carriers has been reaffirmed at the PAX International Readership Awards, where the airline won for Outstanding Food Service by a Carrier in North America and Best Business Class Amenity Kit in the Americas. "We are honoured to have been awarded both the Outstanding Food Service in North America and Best Business Class Amenity Kit in the Americas awards at the PAX International Readership Awards. On behalf of Air Canada, I would like to thank PAX International as well as its readers for these recognitions and awards. These accolades speak to our commitment to customer service excellence, delivered by our dedicated onboard team. Our continuous investment in products and services includes our partnerships with Canadian celebrity chef David Hawksworth, route-specific meals, healthy choices, as well as amenity kits by Montreal-based WANT Les Essentiels with care products by Vancouver-based vitruvi," said Andrew Yiu, Vice President Product, at Air Canada. "We were pleased that our readers voted the carrier of our home country the best in two categories this year: Outstanding Food Service by a Carrier - North America, and Best Business Class Amenity Kit - Americas for its work with the supplier, Buzz. Congrats to Air Canada on this prestigious recognition from the inflight industry," said Aijaz Khan, publisher of PAX International.